Would you like additional lessons like this one? If you’re in the Toronto area, Denise is doing 2 workshop days: Sunday, Nov. 5th and Monday, Nov. 6th where she’ll share lessons like this where the students sing, play, read/write, create, listen and move. REGISTER for Toronto Workshops – Nov. 5 and/or 6th. Participants will get 2 free months subscription to the online site AND will get great lessons to use in your classrooms. 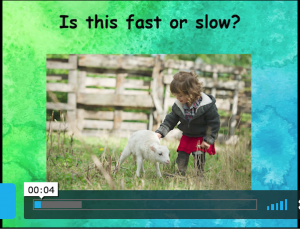 This is a great lesson for the weeks leading up to Halloween, for Grades PreK – Gr. 4. 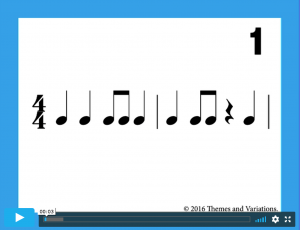 It’s found in Musicplay 2, but because the game is fun, and there are many extensions, you can use it with younger and with older students! When the game is fun, your 4th grade students will still enjoy playing it, especially if you take them outside where they can run. In the kids demo of this game, there were students in Grades 1-5 playing the game. 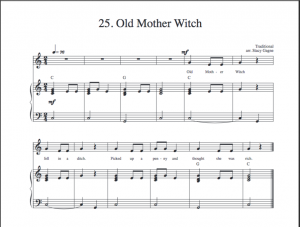 If you are in a school that doesn’t talk about witches, change the word “witch” in the song to “Fitch.” Old Mother Fitch fell in a ditch. Picked up a penny and thought she was rich. There are many extensions given at www.musicplayonline.com! If you have 4 lessons until Halloween, choose 4 of the extensions. Use some of the extensions with K-1, and some are better suited to Gr. 2-3 or Gr. 2-3-4. There is nothing wrong with playing the same game with multiple grades – saves you planning time! The interactive activities are found at www.musicplayonline.com. If you don’t subscribe to the online site, you can do the same activities without the interaction. Many of us have taught before technology and with technology – you can teach all these suggested activities very successfully without technology. It’s just easier for you and may be more engaging for your students with the technology. If you haven’t used the online site . www.musicplayonline.com, you’ll get a free month when you subscribe. 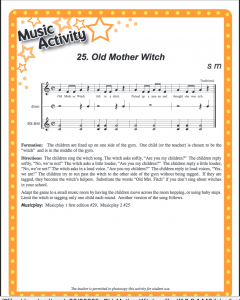 If you tried it before these activities were created, and would like to try it again now, email denise@musicplay.ca to get a free month to try again. 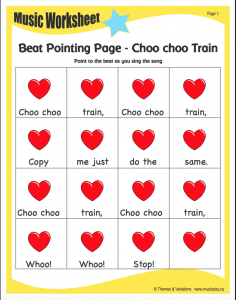 The beat and rhythm activities illustrated below, have been created for over 150 reading songs in Gr. K-6. New activities are created each week! Formation: The children are lined up on one side of the gym. One child (or the teacher) is chosen to be the “witch” and is in the middle of the gym. The children sing the song. in the gym or outside between soccer goal posts. In a small room I restrict the witch to tagging only one child each time, and instruct the witch to tag a child who’s really trying to get away. 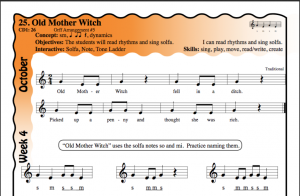 If you are in a school that doesn’t talk about witches, change the word “witch” in the song to “Fitch.” Old Mother Fitch fell in a ditch. Picked up a penny and thought she was rich. 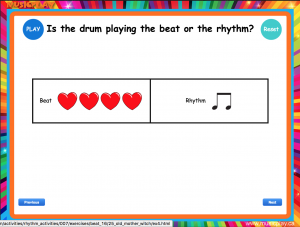 We’ve created interactive beat and rhythm activities for more than 150 songs in Musicplay k-6. Use these activities to teach, practice or assess your students understanding of beat and rhythm. point to the Beat and the beats pulse. 3. 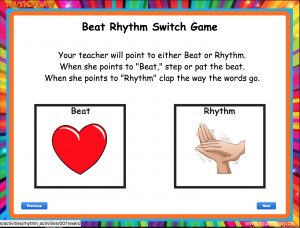 Beat and Rhythm switch game. 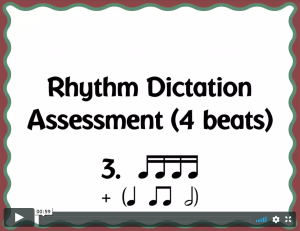 Use this game to observe and assess if your students understand the difference between beat and rhythm. Students pat or step the beat when you point to the heart. When you point to the hands, they clap the rhythm. 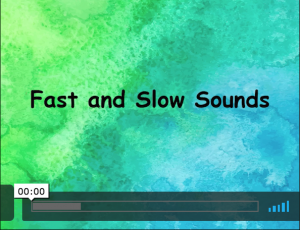 In this activity press play, and you’ll hear a drum playing either the beat or the rhythm. 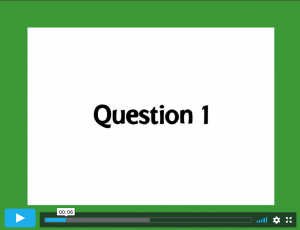 If you answer correctly, the box goes green. 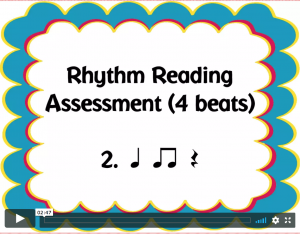 You could do this as a written assessment of student understanding of the difference between beat and rhythm. Is it one sound or two? (notes and rest) . 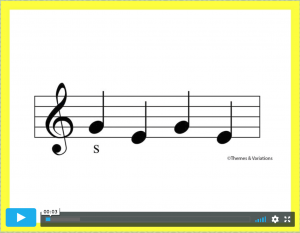 You notate the rhythm of the song. 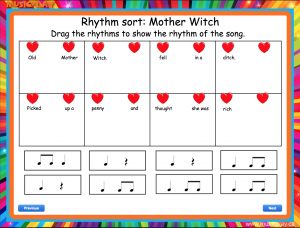 Rhythm Sort: This is another way for students to figure out the rhythm of a song. You can do this as a class activity OR individual activity on devices. 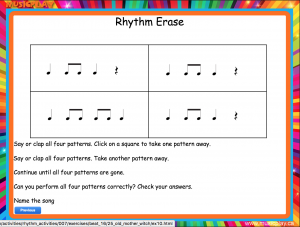 Rhythm Erase: I like to do this a few weeks after I’ve taught the song. 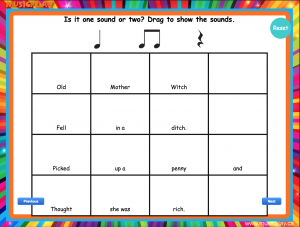 No song title is shown, so after you’ve completed the Erase activity, ask the students to identify the song. I call this “Mystery Song. 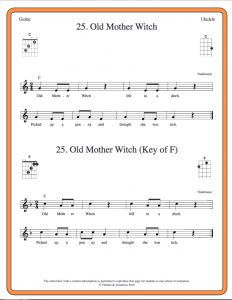 Halloween Word Rhythms: This activity can be used with any Halloween song. 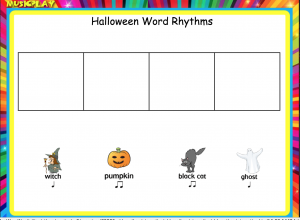 With student input, create a word rhythm with Halloween words. 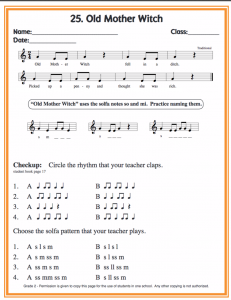 Then, transfer the word rhythm to body percussion or unpitched instruments. When you decide how to play it, you can use it as an introduction to the song. 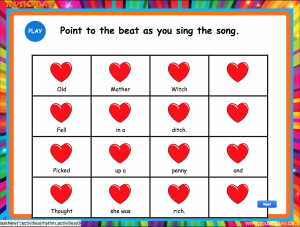 You could use the song as your A section, the word rhythm as a B section – then decide how to perform the song: ABA or AB, or ABAB. 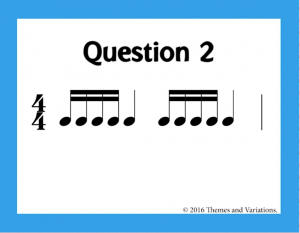 You could use the word rhythm as an ostinato. 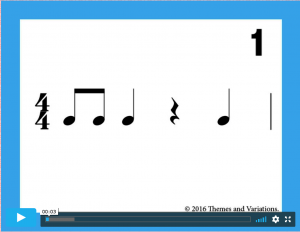 These extensions turn a simple song into a springboard for many creative activities. 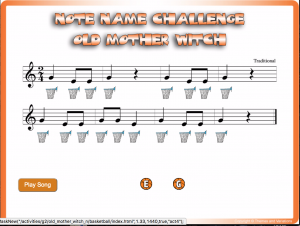 Note Name Challenge: Drag the letter to the basket to name the note. The “basketball” needs to touch the upper left edge of the basket to “stick” there. 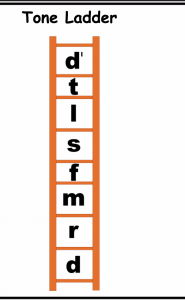 If you teach letter names, do this activity. 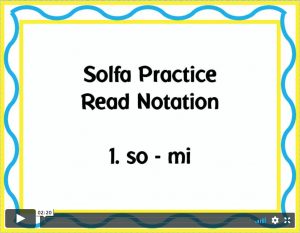 If you teach solfa notes in K-3, do the Solfa Challenge instead. 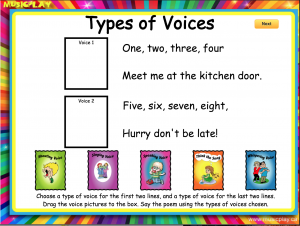 This assessment is in printables of the online site. It’s intended to use as a quick so-mi practice exercise. 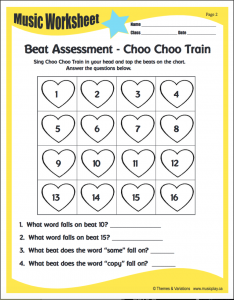 The Checkup can be used to assess if your students can identify a rhythm pattern and/or a solfa pattern that you play for them. 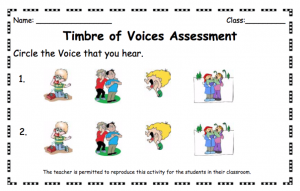 Don’t use this assessment until you’ve taught your students la, so, mi – so grade 2-3-4, not gr. 1. The piano arrangements for every song are given in the “Arrangements” section of the online site. 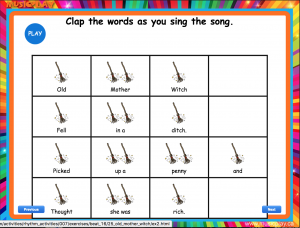 The interactive activities illustrated in this post are found at www.musicplayonline.com. If you don’t subscribe to the online site, you can do the same activities without the interaction. Many of us have taught before technology and with technology – you can teach all these suggested activities very successfully without technology. It’s just easier for you and may be more engaging for your students with the technology. This entry was posted in Lesson Plans, Uncategorized on October 22, 2017 by Denise Gagne.